I have always been a big Kurt Russell fan. He plays anti-heroes, bumbling superheroes, and the everyman character to perfection. Yet, until Dark Blue, I never saw him as a serious dramatic actor who could contend for say, an Oscar. Now granted, Kurt didn't get nominated for his turn as a corrupt L.A.P.D. cop in the movie I'm writing this review on. But he should have. His performance has many more layers than what we're used to seeing from a once famed, child actor. What can I say, as Sergeant Eldon Perry, he is flat out volcanic. Watching him on screen, you feel as if he's acting for his life. I was blown away. Not only is this his best performance ever, but the film outside of Russell, is fantastic as well. Its director Ron Shelton (White Man Can't Jump, Tin Cup), is not known for shooting cop flicks. He's more your lessons-learned-through-sports movie guy. He does however, in this exercise, know the darkest parts of L.A., and he knows how to get his actors to say what they mean and mean what they say. Let's be honest, going into the theater back in 2003, I didn't think a guy who played Elvis and a director who made Bull Durham could deliver a gritty, absorbing, and overwhelmingly solid cop thriller. I have to admit I was mistaken and pleasantly surprised at the same time. Now Dark Blue does come off as a little confusing in the first 10-15 minutes. It then however, settles down to tell its story in a brilliant sort of way that an audience member can not think too hard and be massively entertained at the same time. 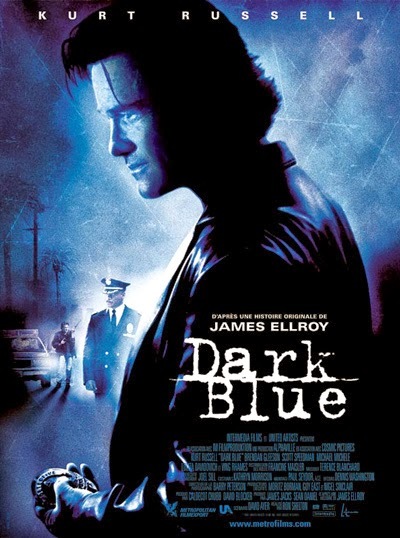 Based on a short story by crime novelist James Ellroy concerning the famous Rodney King trial and serving as a backdrop to the L.A. riots of 1992, "Blue" makes its case as a character study for Russell, his superior officer (commander Jack Van Meter played Brendan Gleeson who specializes in cold, heartless types), and his nervous young partner (detective Bobby Keough played by Underworld's Scott Speedman). Russell's character and Speedman's character take orders from Van Meter who on the side, has two street thugs regularly steal safes and murder for him (the murders aren't the main intention, it's about the money). In return, he lets them stay out of jail therefore putting the burden of having said detectives (Keough and Perry) find, shoot, and arrest similar suspects who had nothing to do with the crimes. As the film carries on, Perry (Russell) along with Keough (Speedman) have epiphanies and start to question their overall motives. Meanwhile, assistant chief Arthur Holland (played by a powerfully gentle Ving Rhames) is trying to crack the whole internal investigation wide open and expose any corrupt doings within the department. This is a smooth, intricately woven plot machine. As I viewed it for a second time, I was heavily reminded of 2001's Training Day. Both films are similar in their examination of the misguided, fallen nature of L.A.'s finest. In terms of the lead, Russell plays a sort of less nastier version of Denzel Washington's Alonzo Harris. Even the endings of these films seem sort of familiar. Both actors in each movie spout off soliloquies and speeches when their vehicles reach their conclusions. The difference with Dark Blue is that it's a lot less bloody and it deals more with moral issues minus the over-the-top gratuitous violence (just call it Training Day lite). Yes, Training Day is also very good. But "Blue" goes deeper and exhausts you as the viewer, in different, more thought-provoking ways. 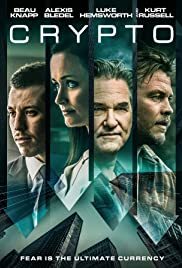 One of my favorite things I like to do as a critic, is find motion pictures that are vastly underrated and painfully overlooked by other critics and the movie going public. Dark Blue may be one of the most underrated films I have ever seen. It came out at the wrong time of the year (March of 2003 in the U.S.), wasn't marketed terribly well, and as a result, tanked at the box office. The fact that it hasn't grown a mild cult following also has me scratching my head. Bottom line: If you haven't seen this masterpiece, please do so. It makes you question how police work gets done, it forecasts a harrowing sense of dread from the opening scene re-shown and hour and a half later, it has sequences in which Ron Shelton puts you right in the middle of L.A.'s terrifying South Central mind field, and it has Russell plowing his way through "Blue" like a bull in a china shop. All in all, Dark Blue is a gem, a revelation and one "dark" film indeed.